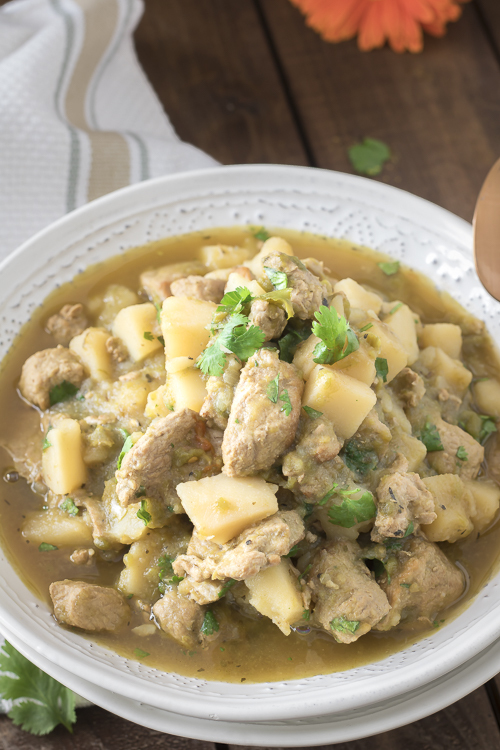 Get ready for this recipe for green chile stew! It will soon become your go-to cold night remedy! My first trip to New Mexico was to check out the grad school I eventually ended up attending. The trip was full of fun, excitement, and trying not to be too intimidated by all the super smart professors! We got to hike and see a lot of the beautiful NM desert. We also got to try lots of delicious food. One thing NM is known for is its green chile. We eat it on everything out here. Pizza, burgers, eggs, tacos, and even some desserts, you name it and I’m sure there is a green chile version! Hatch green chile is well known in the US, but what most people don’t realize is that almost every little town in NM grows their own chiles, and they all claim to be the best! We even have some green chiles growing in our garden right now. After living in NM for several years, you come to realize that chile from different parts of the state have different tastes. Late August and September is one of the best times to be in NM; not only do you get lots of rain from the monsoons, but it’s chile harvesting and roasting time. Most grocery stores and many road side stands will sell chile by the 20-30lb bag and roast them on the spot for you. If you’ve never smelled 30lbs of chiles roasting you are missing out. If they made a candle that smelled like it I’d use it year round. Anyways, since living in NM, my husband and I eat lots of green chile and one of our favorite ways to eat it is in Green Chile Stew. There are tons of ways to change up this recipe, but my husband and I agree this is probably one of the best we’ve had. Hope you enjoy! This New Mexico green chile stew is loaded with the good stuff. 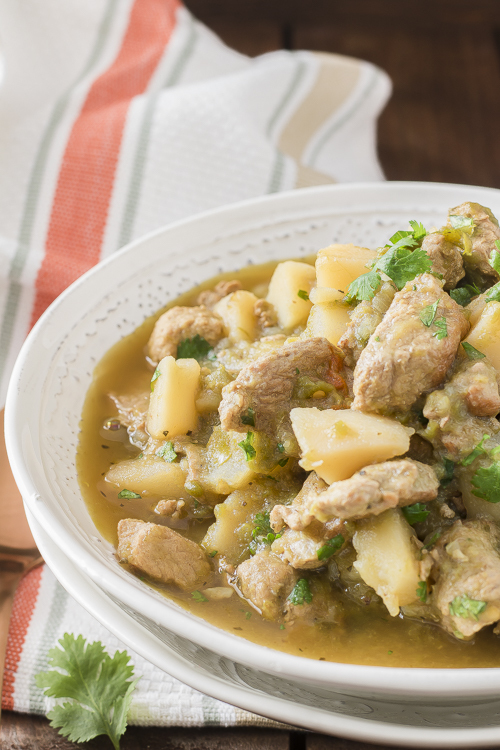 Tender pork, potatoes, cilantro and lots of those green chiles. 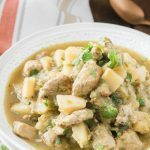 A pork green chili stew like this one will be fabulous for the upcoming fall season. 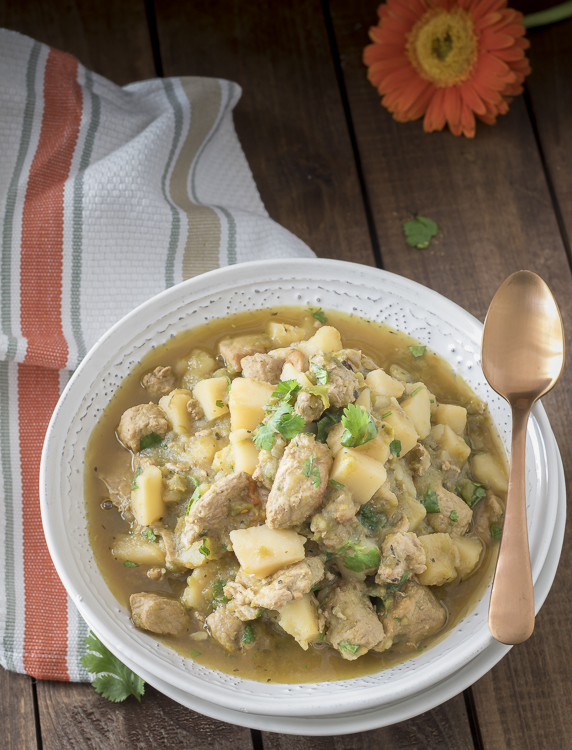 So snuggle up and have a large bowl of this green chili pork stew or try one of our other favorites manly steak soup! A wonderful, hearty stew that is AMAZINGLY delicious! Make for a group or just your family! It's bound to be a hit! Heat olive oil in heavy saucepan over med-high heat. Add cubed pork, oregano, cumin, tomato bouillon, salt and pepper. Cook and stir until pork is browned. Add in onion and garlic, cook until softened about 5 minutes. Pour in beef broth, bring to a boil and reduce heat to low, cover and simmer for approximately 30 minutes. Add cubed potato, cover and simmer for another 45 mins, or until tender. Roast your chiles during this time if they aren’t already roasted. To roast your chiles, preheat your oven’s broiler on high. Make sure to move the oven rack so it is close to the broiler. Arrange the chiles in a single layer on a foil lined baking sheet and put it in the oven. Roast the chiles until they are black, then flip them and blacken the other side. The whole process should take no more than 15 minutes. Try to have the kitchen well ventilated since the smoke from roasting can get pretty intense. Other roasting options include over an open flame on a gas stove top or a bbq. After roasting, stick the peppers in a Ziploc bag and let them rest for at least 20 minutes. This will steam the chiles and make the skins practically fall off. When handling the chiles wearing gloves is advised. Once roasted, peel and chop the chiles and add them to the stew along with the jalapeno pepper. 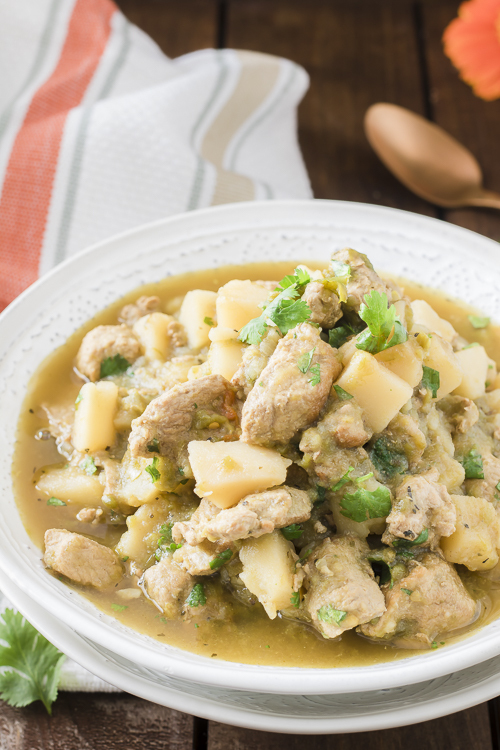 When the potatoes are soft and the pork tender, add the cilantro. Cook for ~5 mins, then remove from heat and serve. I usually end up buying a 4lb pork shoulder, freezing half of it and then making a double recipe with the remaining 2lbs. Cubing the pork shoulder is the most time consuming part because you will have to cut out the bone and cut off lots of fat. All the seasonings are estimates! Use as much or little as you want. If you don’t have beef broth on hand, chicken or vegetable broth will work fine, I just like the rich flavor the beef broth adds. If for some reason there isn’t enough liquid near the final stages of cooking add some water or more broth. I find a lot of the time the opposite is true and the stew isn’t as thick as I want it, so I will add a thickener. Just add cornstarch or flour mixed with a little water and then add it to the stew a tablespoon at a time until it reaches the desired thickness. If you don’t have chile to roast you can buy the canned green chile, but fresh is best! Also, if you don’t want the stew to be too spicy, scrape out the seeds after roasting the chile. This recipe is so versatile! You can add tomatoes, green beans, tortilla strips, corn, or anything you love in stew and it will still taste delicious!